Many antivirus malware protection tests performed round the world were criticized by professionals as they considered them synthetic and far from reality. The first and the main claim was that only some antivirus protection components (such as classical signature detect or heuristics) are tested during the file collection test launch. At the same time, no contribution of other technologies (such as behavioral analysis, HIPS or reputation services, firewall/IDS, HTTP on-the-fly traffic, etc.) is taken into consideration. The second sound reason is that a real user does not store and launch any old malware on its hard drive. As a rule, only Zero-day samples penetrate there and no antivirus can protect against them. The work efficiency can also to some extent depend on the penetration method as some antivirus software can eliminate the infection threat at the stage of malware script launch at the web-page, others do that during loaders activation downloaded with exploit, and the third ones do it even later, with the installed malware start. In this test we analyzed the complex antivirus protection effectiveness to Zero-day malware spread via websites. We collected links to infected websites from different sources. As a rule, everyone can come across such links in search engines, E-mail, ICQ, Skype and other instant messengers or social networks. * VBA32 Workstation Antivirus was disqualified as some technical problems arose during the testing process and thus a part of the results was lost. According to the testing methodology we selected 36 working URL to the websites with Zero-day infection which were used to measure the protection efficiency. 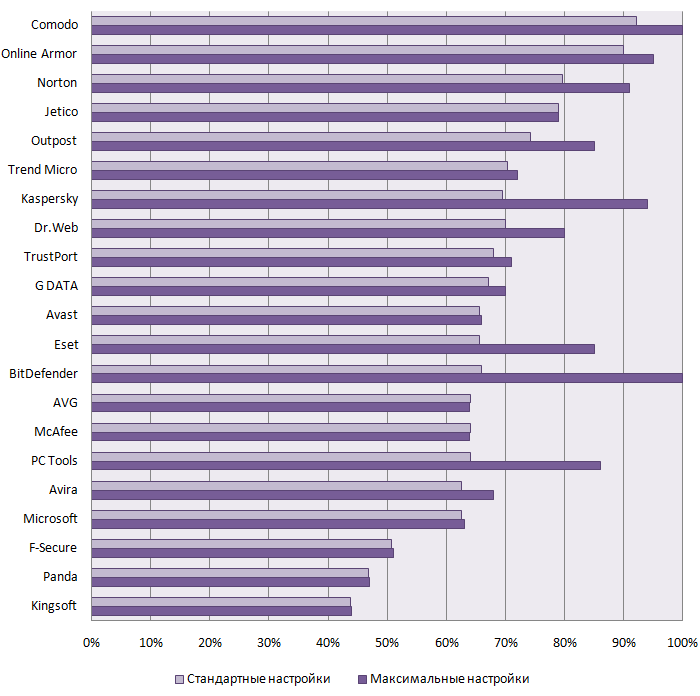 The final results of antivirus software and HIPS comparative testing are given below in Diagram and Table 1. According to the test results, DefenseWall HIPS turned to be the most effective protection against malware as it managed to prevent 100% of infections. So, it is the only one that won Platinum Zero-day Protection Award. The antivirus products showed very good results: Kaspersky Internet Security, Comodo Internet Security and Trend Micro Internet Security, that prevented 80% of infections and won Gold Zero-day Protection Award. If the results for the first of them were quite expected after the analogous test last year, the results for other two were quite unexpected. Sophos Anti-Virus, Safe'n'Sec Personal, Avira Premium Security Suite, Norton Internet Security and Avast Antivirus Professional were quite effective against Zero-day malware and won Silver Zero-day Protection Award. Norton and Avast showed considerable progress in Zero-day threats protection as compared to our previous preliminary testing. Eset Smart Security, AVG Internet Security, Microsoft Security Essential and G-DATA Internet Security turned to be a little bit worse and overcame a 40% level, so they won Bronze Zero-day Protection Award. It is worth mentioning that a new free Microsoft antivirus has quite a good debut and outscored many paid competitors. All the other antiviruses such as F-Secure Internet Security, McAfee Internet Security Suite, Outpost Security Suite, Panda Internet Security, BitDefender Internet Security and Dr.Web Security Space failed the test. Unfortunately, they can be considered as effective protection against malware. The results for BitDefender and Dr.Web wend down as compared to the preliminary testing. “Currently the most cases of the users' infection with malware take place during web-surfing. It can be an infected site link sent via e-mail, ICQ, social network messages or visiting a potentially dangerous site as well as via legitimate sites cracked or infected by cybercriminals. In this case infection comes through vulnerability in browser, its components and plugins such as Adobe Acrobat Reader, Flash Player, etc.